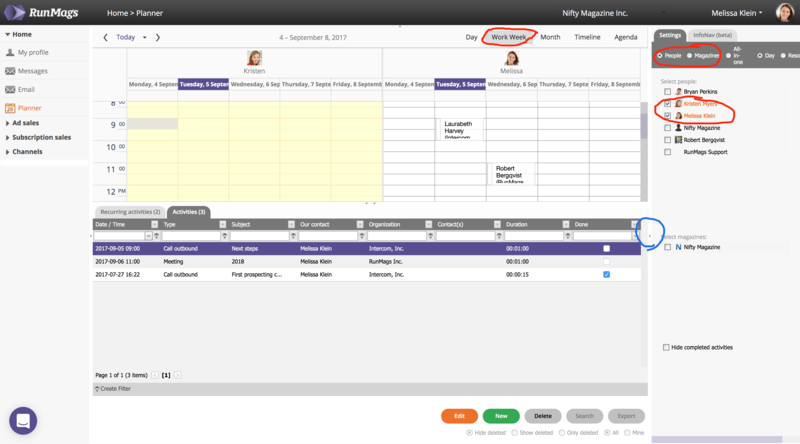 All users can access the Planner tools with calendar and activities in the left navigation column under Home. The Planner can be used for collaborating with team mates as well as working on ones individual calendar. Right click in the calendar to carve out some time for a meeting with a client. All scheduled tasks will show up in the task list below. On the right hand side you can select which colleagues' schedules you want to view. Check off which magazines that you want to view tasks and issues for. Circled in blue is a small triangle that can be used to maximize the calendar view. This will hide the Setting menu on the right. If you hide Settings you can reveal it again by clicking the small triangle again.